Realising Your Dreams With PIDM Undergraduate Scholarship Programme 2017 Perbadanan Insurans Deposit Malaysia (PIDM) is a statutory body that protects against the loss of bank deposits, as well as takaful and insurance benefits in the unlikely event of a member institution failure and is mandated to promote public confidence in the stability of the financial system in Malaysia. Applications for the 2017 Scholarship open on 10 March 2017. Stay tuned for more information. 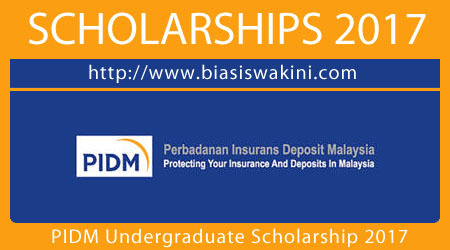 What Does The PIDM Undergraduate Scholarship 2017 Offer? - There will be no bond to this scholarship and the recipients are not required to repay the amount of scholarship awarded. 0 Komentar untuk "PIDM Undergraduate Scholarship 2017"